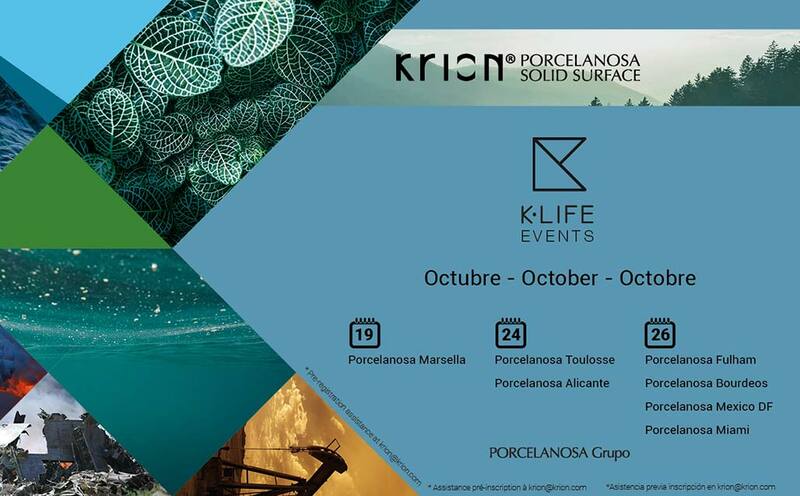 After Madrid and Barcelona having seen how KRION K-LIFE, the new solid surface from PORCELANOSA Group, contributes to improving quality of life, the tour of Spain continues in Alicante on the 24th of October. K-LIFE’s journey around the rest of the world will then begin. France: 19th Marseille, 24th Toulouse, 26th Bordeaux; United Kingdom: 26th Fulham; Mexico: 26th Mexico City; United States: 26th Miami. With prior registration, attendees can view the travelling, sensory presentation in which the new properties which will change the world of the solid surface can be discovered in a fun and original way, followed by a brief talk to answer queries on how K-LIFE purifies the air. The event will end with an aperitif for all who wish to accompany us in this important moment for our company.